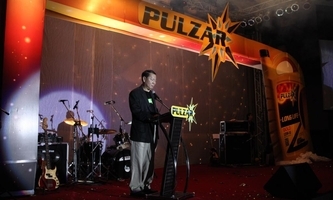 Bangkok, Thailand: July 31, 2011 – Over 700 people, including more than 300 dealers, help PULZAR officially launch its new brand of motor oils. Customers preview the first PULZAR television commercial, “Into the Engine,” live on Channel 7 at the Rama Garden Hotel in Bangkok. Their feedback is impressive and confident. The celebration features drawings, games and a concert by “The Star” artists. Sales of PULZAR motor oils begin briskly on August 1.